Figure 1. 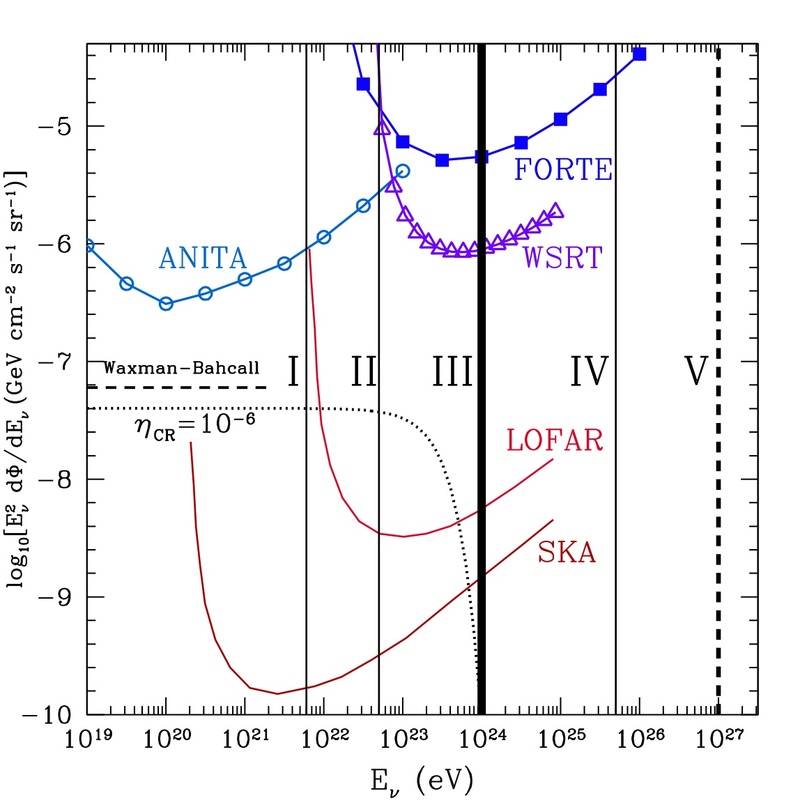 A diagram showing how the detectors in the IceCube grid measure the signal of a neutrino. The colors represent the time that each detector received the signal. This is an example of a “track” event. Most of astronomy focuses on measuring light from distant objects in our universe. Photons of light — whether radio, infrared, visible, ultraviolet, x-ray, or gamma ray — are fundamentally the same, just from different parts of the electromagnetic spectrum. Neutrinos, on the other hand, are a completely different type of particle, but they also bring us information about the cosmos. Photons are mass-less particles that fly through the universe at the speed of light, while neutrinos do have a very small mass and travel at nearly the speed of light. Photons interact easily with matter, while neutrinos have no electric charge (they are “neutral”, as their name suggests), so they are unaffected by the electromagnetic force and pass through most materials effortlessly. Detecting photons is relatively easy; detecting neutrinos is not. The IceCube neutrino detector is designed to find the signal of the rare neutrino that does interact with material while passing through the Earth. IceCube consists of 5,160 light-sensing detectors arranged in a giant 3D grid within the ice under the South Pole. When a neutrino collides with an ice molecule, it creates a muon that then radiates a cone of blue light (called Cherenkov radiation) as it propagates through the ice. This light is detected by the grid of sensors, which allows the original neutrino’s incoming trajectory to be reconstructed (see Figure 1). For more detail on how Cherenkov radiation is produced, see this recent astrobite by Justin Vasel. When the IceCube collaboration analyzed the two years of data collected by their sensors from May 2010 to May 2012, they found the signals of many neutrinos. We know that neutrinos are produced by extraterrestrial sources, but neutrinos and muons are also generated in our own atmosphere — which is not very interesting from an astronomical perspective. So was IceCube actually probing the distant universe or just our atmosphere? Figure 2. 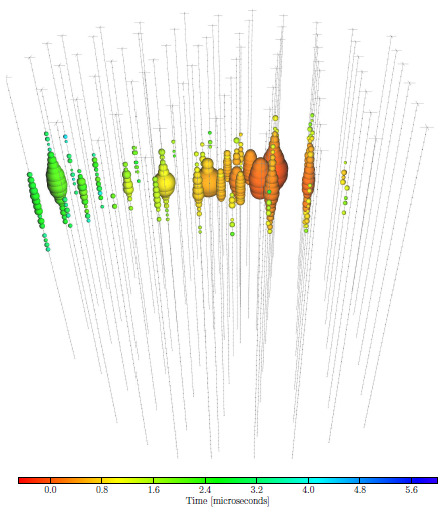 The energy distribution of detected neutrinos. 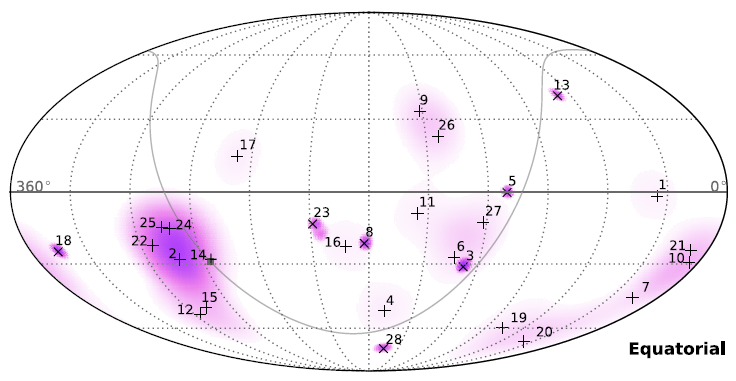 The colored curves show the predicted signal from the atmosphere and the black points show what IceCube detected. The high energy detections are very likely extraterrestrial. The first step in finding the answer was to examine the energy of these neutrinos. 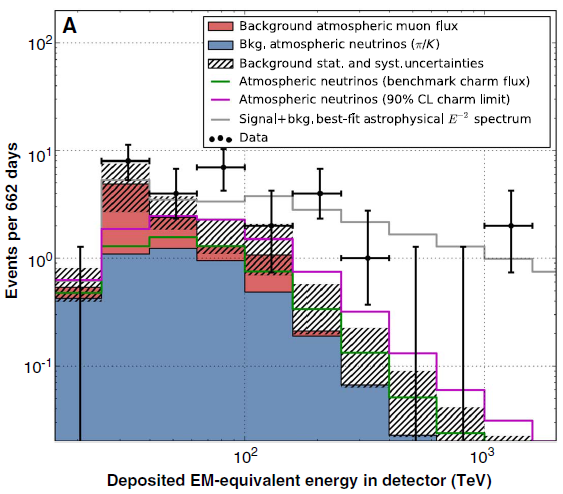 The energy distribution of atmospheric neutrinos peaks at low energies (see Figure 2), so the collaboration focused only on neutrinos traveling with energies above 30 TeV (1 TeV is one trillion electron volts). They found 28 of these high-energy neutrinos, whereas they expected to see only 10 atmospheric neutrinos in this energy range. Of these 28, nine had energies above 100 TeV (whereas the atmosphere was only expected to produce one), and two had over 1,000 TeV of energy. Thus, they must have detected several neutrinos of extraterrestrial origin. Second, they examined the shapes of the light signals produced in the grid of detectors. The shape of the signal is either a spherical “shower” event or a linear “track”, depending on the type of reaction with the ice. They find that the majority of their detections are “showers”, which is expected from extraterrestrial neutrinos but not atmospheric ones. This also suggests that many of the detected neutrinos were extraterrestrial. Finally, the collaboration considered the distribution of the directions of incoming neutrinos. They detected more neutrinos coming into the Earth from the south (downwards into the detector from the point of view of someone standing at the south pole) than from the north (upwards into the detector). Considering that the Earth itself will shield some of the neutrinos coming in from the north , their data are actually consistent with extraterrestrial neutrinos coming from all directions. Where Did These Extraterrestrial Neutrinos Come From? Figure 3 shows the directions from which each neutrino originated, although the researchers have not yet been able to identify their sources. While there is a hint of clustering near the direction of the center of our galaxy (where the super-massive black hole is a potential neutrino-producer), the authors note that this is not statistically significant. Neutrinos originate from many astrophysical phenomena such as supernovae and active galactic nuclei (AGN), and they may help us understand the origin of cosmic rays (neutrinos are produced when cosmic ray particles are accelerated). IceCube will need to wait for more data before it can definitively identify the extraterrestrial neutrino sources, but it has, for now, shown that they exist. Figure 3. The locations in the sky from which the 28 detected neutrinos originated. The gray line is the galactic plane and the gray square (towards the lower left) is the galactic center. There is no evidence for significant clustering of neutrinos from any one source.